Snitch has an agenda here, and there’s a Frontline documentary that inspired this movie. John Matthews (Johnson) agrees to go undercover for the feds to rescue his son- a first time drug offender- from a mandatory, minimum 10-year sentence. I’ll quickly summarize the problem that the movie addresses. Prosecutors are relying on informants to help take down other drug offenders. The problem is sometimes these informants are caught with large amounts of drugs and are facing lengthy prison sentences. But, if they ‘snitch’ or set up a situation where prosecutors can catch another offender, the informant will receive a minimal sentence or no sentence at all. Sometimes the people who are set up are first time offenders and they will automatically serve 10 years while the informant (who’s probably been in the drug game for awhile) will serve less time than that and possibly get back into drugs after they are released. I’ll reserve my opinions on that matter, but below you can find my opinions on the movie itself. 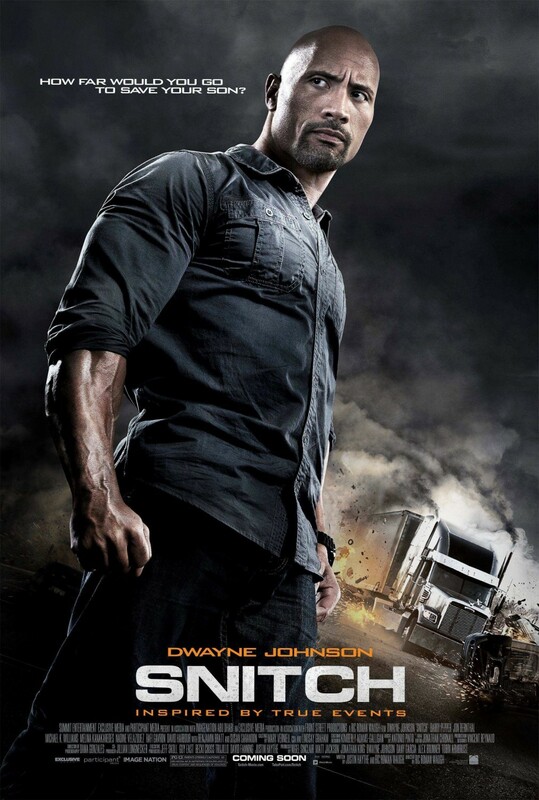 John, played by Dwayne Johnson (I’m refraining from calling him The Rock and doing his eyebrow thing), is a family man who owns a successful construction company. His son, Jason, is arrested after his friend mails a large pack of prescription pills to him, even though beforehand Jason told his friend that he didn’t want them. Joe works undercover for the DEA and if he can help lead to the arrests of a drug dealer or two then U.S. Attorney Keeghan (Sarandon) will free Jason from his sentence. I think Johnson took this role because it’s a huge departure from his action movies where he stands on-screen and looks tough, shoots guns, and fights people. The biggest problem is, he’s supposed to play a sensitive family man who feels out of his element when he starts communicating with the drug dealers. It was awkward watching him cower in the presence of the dealers, especially when he’s easily the tallest and strongest person in the room. Seriously, there were many scenes when his muscles were bulging from his shirt so he wasn’t believable as a scaredy-cat. It didn’t help that the other characters were so predictable. Jon Bernthal (The Walking Dead) plays Daniel, an employee at Joe’s company and a convicted felon who leads a clean life until he introduces Joe to his former drug buddies. Michael Kenneth Williams (The Wire) plays a local dealer who gives John a hard time (of course) and Susan Sarandon lends her top shelf talent as the U.S. attorney. There’s a bit of action in this movie, but the storyline is so heavy handed that I really wished for some moments of humor. Instead I drudged through almost two hours of scowls and some bad editing. The plot takes place in a few different cities and sometimes it was hard to tell which city the characters were in. Johnson gives it his all, but he can’t carry a drama. His ‘concerned’ look is a little too wide eyed for me, and frankly, he can’t act very well. So, what are your thoughts about Snitch? Did you enjoy, or do you plan to see it? It’s not the best movie you’ll ever see, but at least it does well with what it has. And that’s all that mattered to me. Good review.